It was 30 degree cold and windy night. After a couple neutral laps, 85 racers lined up at starting line. During wait for start, I spoke to Gil, but I knew I spoke to myself. "Only first few laps are dangerous. no need to do anything crazy." I started race from bottom of pack. Maybe I relaxed little too much at that moment. Clip in was smooth, trying to get to front, passing racers. Jody(Affinity) rode such a relaxed pace, Frank(Boogie Nights B field winner) was rocking so hard. Looking for my training mates, but they were out of my sight. After few laps, Jason(Affinity) and Tadashi crashed at hairpin in parking lot. I tried to catch the pack, but couldn't see how much the gap, rode alone. Not sure at which lap, I cleared the hairpin and accelerated, and I saw leader pack went into hairpin. Race director yelled to me "get out the course" at finish line. It was super fast race and lots of fun. 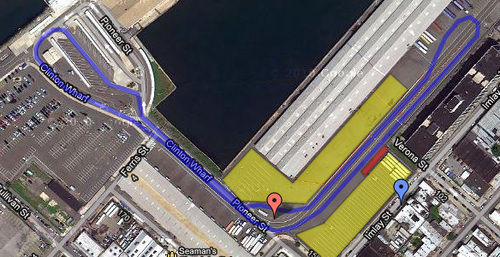 Course length was 0.8miles (1.28km), The Fastest lap was 1:38 by Neil Bedzek. Thank you for all volunteer, organizer, spectator, racers and everyone who made this event happen.